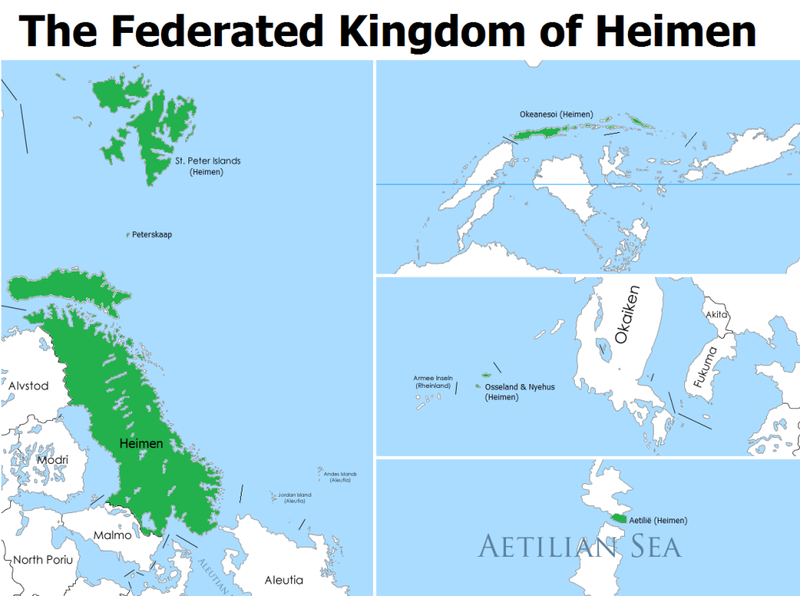 Hello evereyone, I present to you my application for the Federated Kingdom of Heimen, or short Heimen. 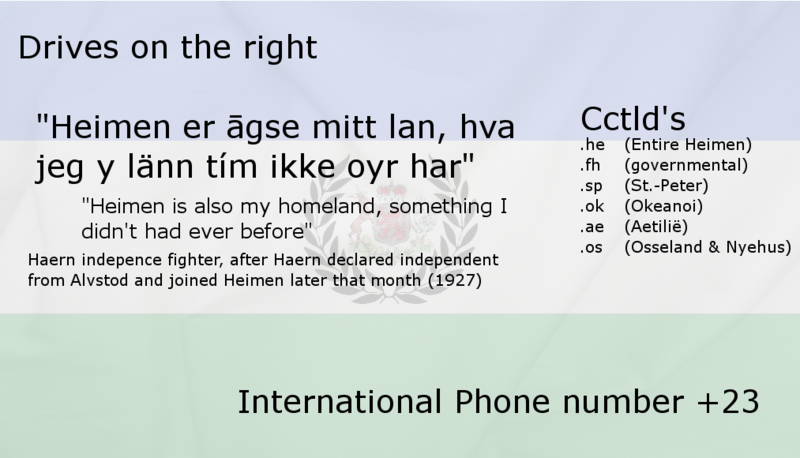 Below you can see the flag of Heimen. Blue stands fo the, lakes, the ocean and the rivers. White is for freedom, peace and justice. 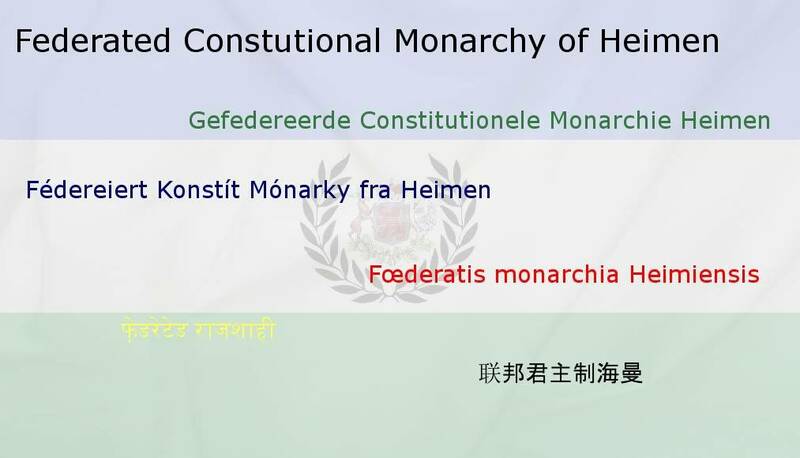 In the white banner is the royal seal, the royal have been connected to Heimen for centuries. 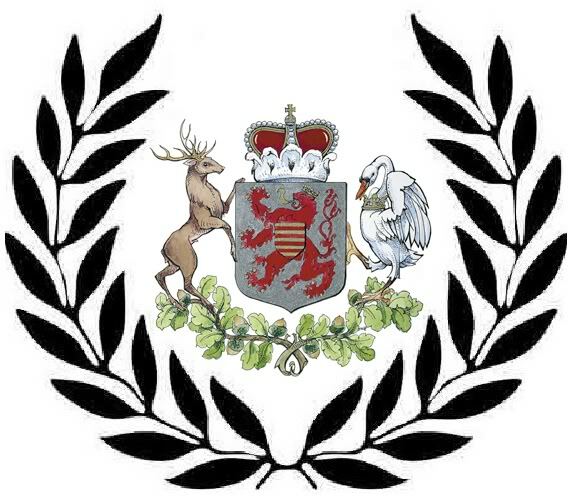 Here is the already mentioned Royal seal again. The mainland of Heimen is situated in Northern Evropi. To the North are the St.-Pieterseilanden(St. Peter isles) and Peterskaap (Peters' Cape) In the Voreian bay lies the archipelago of Okeanesoi. Between the Oikaken on the Mainland and the Rheinland Armee isles are the two islands Osseland and Nyehus. At the sea street between Imera and Aelos lies the tiny colony Aetillië(Aetilia). 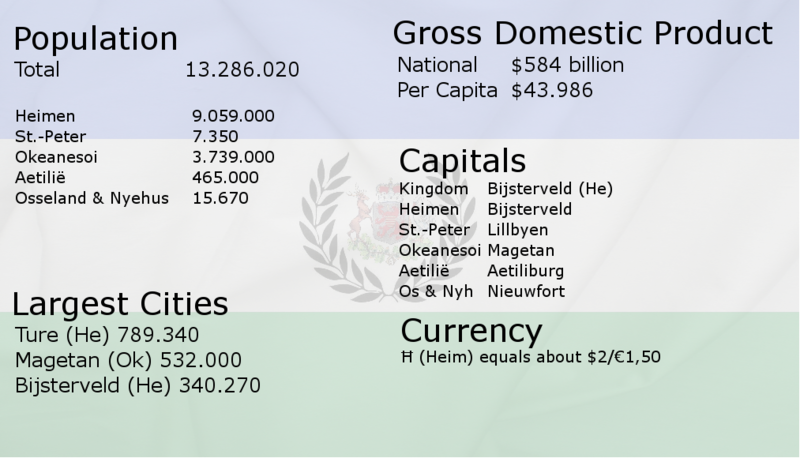 The countries I used for reference are for Mainland Heimen: The Netherlands, Sweden and Norway. For the St.Peter isles Svalbard. Okeansoi is like Indonesia, Osseland & Nyehus were inspired by Taiwan, and as last Aetillië is a mix of Gibraltar and mostly Sri Lanka. Great CJ! 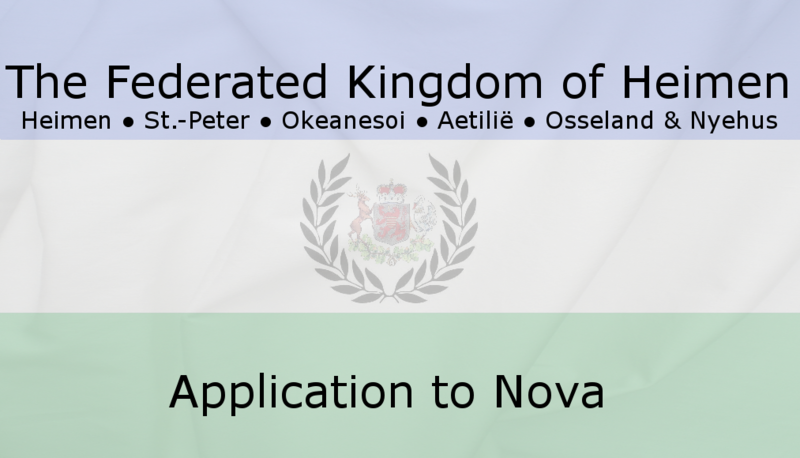 You're accepted Welcome to the Nova Project. I recommend you get skype! You can add me, my name is "saathoff37" we have general off-topic chatroom all the members talk in! Why does your nation speak chinese and hindi as it being so far from it? His nation resembles the UK in a way. Look at the map it has territories. Looks excellent and now I have a new neighbor welcome to Nova. Welcome to Nova! I'm sure you'll have a great time! @Tyler: Thanks! You were Aleutia weren't you? @Stanislavsoltys: I sure will, and I already have!